Myron and Marty Leggett. Photo by Anthony Rao. 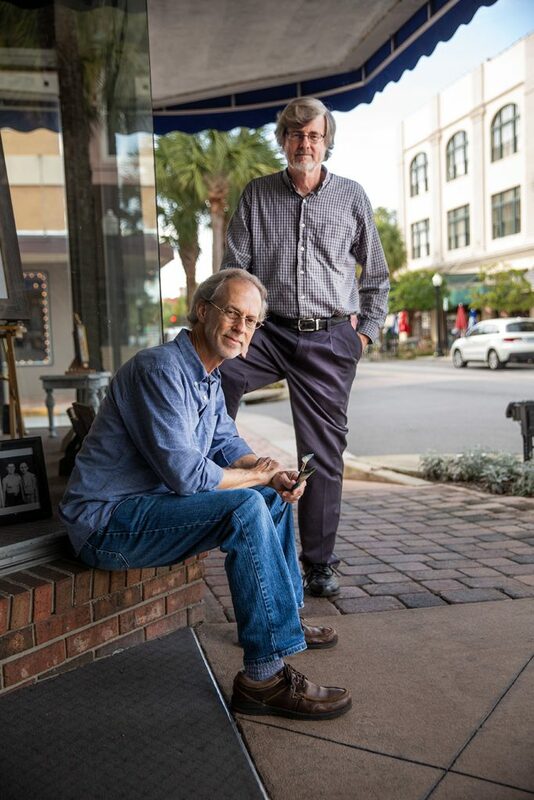 The Leggett brothers’ focus has always been on Leesburg. When Marty and Myron Leggett reminisce about growing up in Leesburg, the conversation bounces from their Cherry Street home (now a retention pond) to the best tackler in a game of Capture the Flag (their dog) to jokes about who’s older (it’s Marty). The brothers, who were born in Main Street hospitals and now work next door to each other on Main Street, have a lot of history to share. At least six generations of Leggetts have lived in Central Florida, and relatives on their grandmother’s side bought land in North Florida in 1826. Their parents, Gene and Ginger, own the 138-year-old building where Marty operates an optometry office and Myron runs a photography studio—similar to childhood, when the brothers worked side by side at Dairy Ranch and mowing lawns. Myron and his wife, Sandy, had a sign and screen-printing business, but in their 20s, they started photographing weddings for his parents’ business. He eventually transitioned to photography full time and developed his passion for painting portraits from photos. Leesburg’s history is important to the brothers. In his office, Marty displays photos of the city’s early days. They remember going downtown to Sears, JCPenney, and Vincent’s dime store. City events have made Leesburg bigger and better for business, they say, but “downtown is still downtown” because many landmark buildings remain. Some things never change—like the Leggetts’ connection to Leesburg.